Photo courtesy of Tami Sisson. (BPT) - A growing number of children are not content to keep all their efforts inside the classroom or play video games. 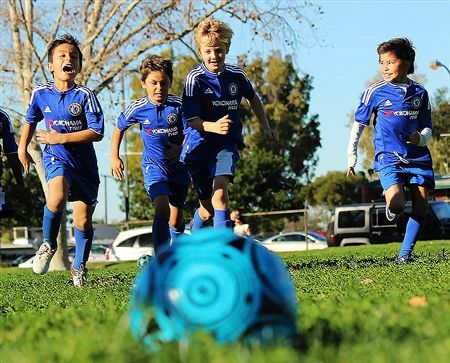 They seek out different outlets like sports - especially soccer, which makes the largest youth sports organization in America - in order to learn, socialize and have fun. According to data from the U.S. Census, nearly six out of 10 children between the ages of 6 and 17 are involved in at least one after school extra-curricular activity. Children are stepping out to stay active, but they need some help to get there - literally. Even world-class soccer players on English Premier League champion Chelsea FC once needed parents to drive them around. It’s best to check your tires when they are cold, which means at least four hours since the vehicle was driven. Use a reliable tire gauge and make sure the valve is free of debris and water. The correct tire pressure is actually specified by the manufacturer of the vehicle, not the tire manufacturer. You can find the proper inflation levels on a placard on the inside of the car door or in the owner’s manual. * Tires must be replaced when the tread is worn down to 2/32 of an inch (the lowest legal limit). It's best to replace them before they reach 2/32 depending on your drive (geographically and type of streets). Help your kids kick off their season right by giving your tires some extra care. Tire maintenance is one extra-curricular activity you can't afford to miss. For more tire information, care and safety tips visit www.yokohamatire.com/tires-101 or www.rma.org.